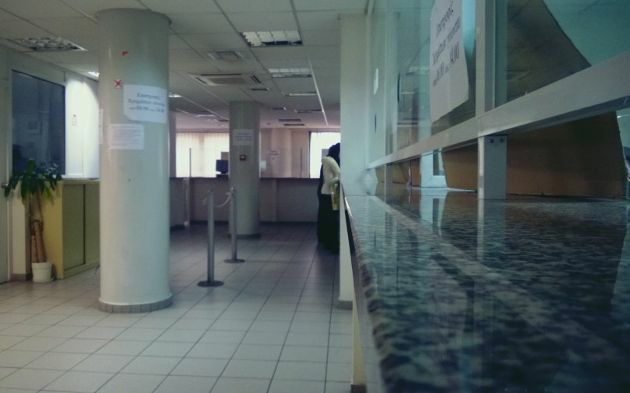 Like thousands of citizens, Nikolas Elliniadis had left it to deadline day to go to his bank, in Thessaloniki, Greece’s second city, to pay the first of six instalments of Greece’s new property tax, the latest levy to hit a population beleaguered after five years of austerity. Finding a long queue, the 70-year-old pensioner took a number, sat down and prepared himself for a long wait in the crowded room as flustered officials tried to process a last-minute deluge of property tax remittances. In many cases, these were being paid with pensions that had been distributed only the day before. An hour and a half later, after saying he wasn’t feeling well, Elliniadis collapsed. He was having a heart attack. Although his fellow customers and the emergency services did what they could, he was pronounced dead on arrival at hospital. Although his grieving family later said that he happened to be in the wrong place at the wrong time, Elliniadis’ sudden death in a long bank queue was, in the public eye, invariably blamed on the property tax that has proved deeply unpopular in a country where 80 percent of people own their own home. The levy is so despised that it’s commonly described as the haratsi, after the poll-tax imposed on non-Muslims during Ottoman rule centuries ago. “The property tax kills,” read one newspaper headline. For a friend in his mid-50s who has been desperately looking for work for almost two years, the man’s death exposed some strongly held national stereotypes about Greeks. “It’s a lesson to all those Germans who think Greeks are freeloaders. We are actually dying to pay our taxes even if it’s the last thing we do,” he said. This month marks the anniversary of the 2009 general election, after which the new government revealed that the country’s deficit was much worse than expected. Within months, the European Commission, European Central Bank and IMF – collectively known as the troika – were called in, imposing austerity in return for emergency loans. Three years of strikes and mass protests followed. Hundreds of thousands of demonstrators took to the streets of Athens and other cities, sometimes on an almost daily basis. These often descended into violence, ensuring Greece a prominent place in the international news. Protests still take place, but are far fewer and much smaller than anything seen in 2010, 2011 or 2012. Much of that anger against EU-imposed austerity has been replaced by resignation and despondency. And in this sense, the death of a pensioner while queuing to pay another austerity-related tax could be seen as a metaphor for how the mood has changed among Greeks five years into austerity. Many Greeks will tell you that they’re too consumed with their daily personal battle for survival to worry any more about the bigger picture. The official statistics show the enormity of the problem. Unemployment is at a European Union high of 27 percent. If that wasn’t bad enough, only 15 percent of the registered jobless receive the monthly unemployment benefit of 360 euros ... as dole here is paid out for a maximum of 12 months. After that, the unemployed are left to their own devices. Effectively, there is no social safety net. While the tax-collection system has become vastly more efficient, far less attention has been directed towards developing the country’s social welfare system, already weak before the crisis. Greece remains the only EU country without a guaranteed minimum income and is among the most sluggish when it comes addressing social inequality and helping citizens living in extreme poverty and social exclusion. A recent study showed that 2.5 million citizens are already living below the poverty line, with a further 3.8 million at risk of poverty. Many of those people threatened by poverty have jobs. But being employed in Greece doesn’t necessarily mean you have an income. One in three workers is owed between 3 and 12 months’ wages. Many of my own colleagues at a major daily newspaper are in that boat; they’re owed about eight months’ salary in total. Every second or third week, they receive a fraction of the amount they’re entitled to. The slow trickle of payment ensures that most continue to suffer an injustice. There are no alternative jobs. And if they do leave, they’ll end up losing whatever is owed to them. It’s a complex dilemma that many employers are only too eager to exploit. If others can get away with it, why can’t I, seems to be the view in many workplaces. One reporter says that, on top of what he needs to feed his family, he owes four months’ rent, a few electricity bills and his car insurance – in total, that’s some 3,000 euros. It’s the fear of falling off the social cliff that coerces employees like him continue to clock in. At least, the newspaper pays its workers’ social insurance, which counts for something in a country where the legions of uninsured can no longer expect hospital treatment and medicines unless they can foot the bill. And it’s a similar fear, that ending up in tax arrears could see you put out on the street, will ensure that most homeowners will pay the property tax, even if it’s with their last cent.